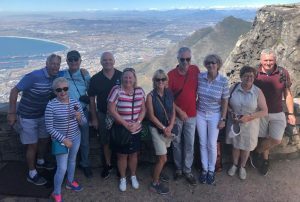 From the moment we left our departure airports on our various journey’s to Johannesburg to start our “Golfing Trip of a Lifetime” there was a communal excitement generated by what was to come in the next couple of weeks. Was anyone disappointed at the end of the trip – I don’t think so (judging by the testimonials received since) ! 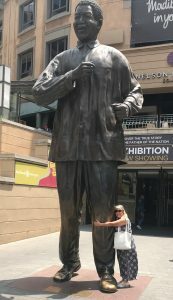 Marie with a certain Mr Mandela ! 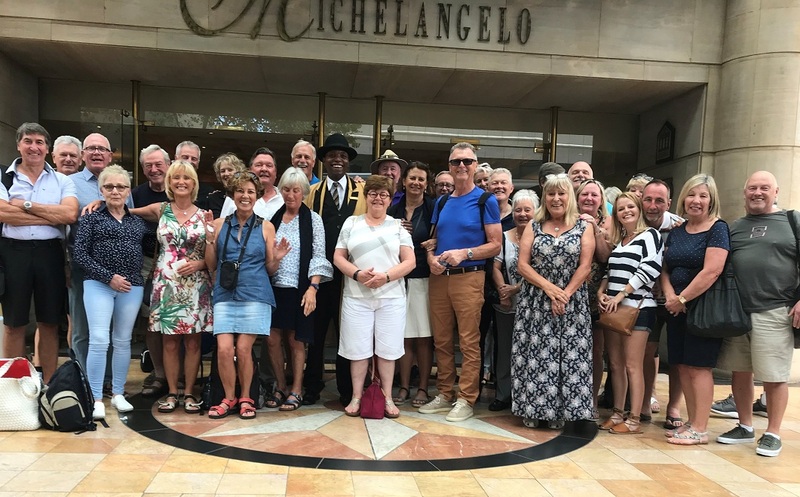 Our arrivals and transfers to The Michelangelo Hotel went pretty much like clockwork before all 32 of us met for a pre holiday get together at the fabulous Piccolo Mondo Restaurant inside the hotel. For us (Marie and I) this remained the culinary highlight of the whole trip with our chosen steak and superb creme brulee being absolutely wonderful. The second day included golf at the Glendower Golf Course which was, even though a bit long for us mere mortals, a delight to play. Tony and Pauline Cavanagh were winners on the day with a pairs better ball total of 34 points. The non golfing ladies came back with unbelievable pictures after their trip to walk with the lions and cheetahs at The Lions Safari Park. As the Michelangelo Hotel was right on Nelson Mandela Square and Sandton City Shopping Mall, much of the rest of our stay in Jo’burg was spent shopping and eating in the plethora of wonderful local dining establishments. Not a bad start before getting prepared for the rest of our South African adventure…………..
Much of the pre holiday talk and excitement revolved around our two night journey from Johannesburg to Cape Town on the very swish and luxurious Blue Train. Did it disappoint ? Not a bit of it ! The 8.45 to Waterloo was never like this ! 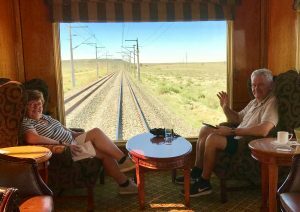 Starting in the Blue Train’s own departure lounge, we were greeted with a champagne reception nibbles and cool mood music, prior to our short cross town trip to board the train. After being ushered by our own individual butlers into the luxury suites, the train departed dead on time at 6.30 pm. 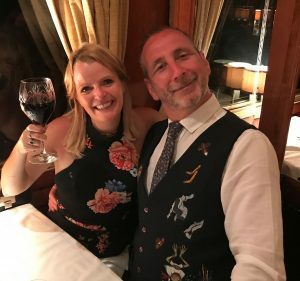 The early dining group dressed up royally for their super fine dining experience before retiring to one of the lounges on the train for after dinner drinks, while the later diners repeated the exersize a couple of hours later. All inclusive really did mean all inclusive, as the drinks flowed (it was a job to stop the waiters continually topping the glasses up) and the food was available at breakfast, lunch, afternoon tea and diner. Day two included a very interesting trip to The Kimberley Diamond Mine (“The Big Hole”), where our local guide completed our tour with the single apt word “happiness” being the moving on statement every time he finished showing us each part of the tour ! Back to the comforts of the train for another sumptuous meal and overnight stay on board, before the rest of our South African adventure………. 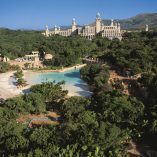 After leaving the delights of the train we were whisked off in our coach for the short trip across town for checkin at the 5* Table Bay Hotel, positioned at the heart of the Victoria and Alfred Waterfront. Wow, that is some view ! Just to get things going a group of us headed on down to the heliport for a 25 minute flight over Cape Town taking in the sights from the sky. 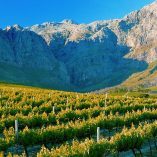 An additional guided tour of Cape Town and a cable car to the top of world famous Table Mountain added to the Cape Town experience. This is a buzzing metropolis full of classy restaurants, fun bars and shopping malls not to be missed. 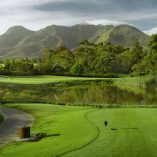 After generally bedding in at this super location we prepared for our second round of golf at the Royal Cape Golf Course, a very flat course which gave the four ball am am pairing of Bill and Heather Marr, Laurie Passman and Ian McAdam the opportunity to grab victory with an 85 point winning score. The non golfing “group within a group” took a trip to see the penguins at Boulders Beach (strange to see penguins in the sunshine, but hey…..). 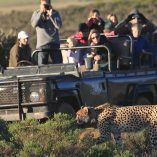 After more super wining, dining, shopping and generally hanging out in this unique part of the world, we looked forward to the next stage of our South African adventure……..
A trip to South Africa would not be complete without a safari stay would it ? So we boarded our luxury air conditioned coach for the trip to the Garden Route Game Lodge, situated on the celebrated Western Cape Garden Route. Having checked in late afternoon to our superb safari lodges, we changed into our safari outfits for our first evening game drive which included the obligatory sundowner in the savanna. Wey hey – Let’s go and see the “Big Five” ! Having already seen two of the “Big Five” (Rhino and Cape Buffalo) we looked around gingerly just in case we had to make a hasty retreat back to the safety of the jeep but, fear not, our trusty guide made sure we were safe. We all arose early for breakfast the second day before our morning game drive where we ticked off numbers three and four of the “big five” (elephant and lions, the leopard unfortunately eluded us to make the full set) before preparing ourselves for the final part of our South African adventure………. Talk about save the best ’till last ! 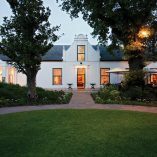 Having driven a couple of hours from the safari lodge there were astonished gasps throughout the coach as we pulled into Fancourt’s hotel entrance. Wow, if there is a more stunning first impression sight for golfers than the Montagu Course’s finishing hole, with its semi island green and lilly pad laden lake, then I am yet to see it ! I would be the first to concede that sometimes superlatives are used too liberally, but this place is, for me, as close to golfing heaven as can be imagined. Pictures sometimes lie with new found sophisticated techniques to enhance almost anything or anyone, but this looked even better than the pictures we had all been looking at for weeks and months before our trip. Gary and Jules – Outeniqua winners ! Day one at Fancourt was a dream playing the Outeniqua Course, with its mountain backdrop and thatched cottages and villas providing a stunning backdrop. Gary Shingler and Jules Walton cleaned up on the day with a Texas Shambles score of 74 points. As always, we retired to the Fancourt club terrace to run through the various “if only’s” and missed putts that would have changed everything, but congratulations to Gary and Jules on a well deserved victory. 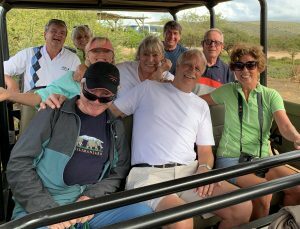 The non golfers visited the nearby Ostrich Farm and Cango Caves and Wildlife Centre and once again came back full of superlatives and super pictures for us all to see. A draw in the men versus ladies matchplay ! A team event for day two at Fancourt as the guys took on the girls in a matchplay format. We highjacked Fancourts whiteboard to use for our own scoring record and after the guys took an early lead, the girls came back strong to deliver a drawn match. 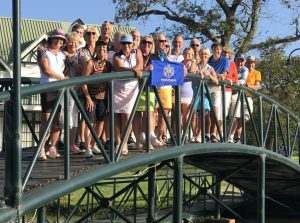 We all got together on the Fancourt bridge to take a picture of the two teams together with the Montagu banner for our memory of another excellent golfing day in the South Africa sunshine. The non golfing ladies chilled with a complimentary spa at Fancourt’s wonderful Roman Bath and jacuzzi, sauna, steam room and tepidarium. But as with everything on this holiday, there was still more to come ! Jules wins at The Links with an unbelievable 41 points ! The slope on South Africa’s No 1 golf course confirmed to us in advance that this one was not going to be easy. For example, a 16 handicapper man receives 11 extra shots ! But what an experience. Every player had to have their own caddy. Every player (unless showing a medical certificate) had to walk the course. We were immersed in a mixture of fear and anticipation in equal measure. Mind your feet there Gill ! It was, however, another wonderful episode in our overall golfing experience in South Africa. Jules Walton carded her second victory of the tour, although this time her single stableford score of 41 points on such a tough course will stay with her for the rest of her life. 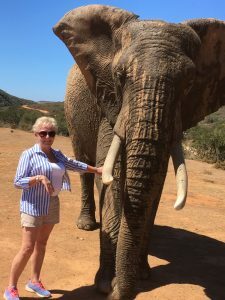 The non golfing ladies “group within a group” decided to go and walk with the elephants at Mossel Bay’s Elephant and Game Tour. The tours that the non golfers did emphasised just how much South Africa has to offer outside of our beloved golf. The above is just a short summary of a trip with memories that will stay with us all for many years to come. 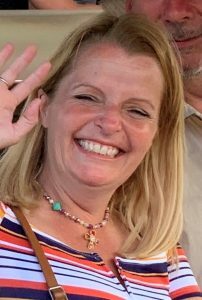 There was, throughout, much fun and laughter (just look at the pictures and testimonials below). South Africa is a special place with a great infastructure, ask Fay Watterson who, unfortunately, during the trip had to go into hospital in Cape Town. She was treated wonderfully in The Christiaan Barnard Hospital where she stayed with husband Roy for the rest of the trip before travelling home with the rest of the group.